Ringgold Elementary School participated in McTeacher Night which was held on Thursday, January 13, 2011, 5pm-8pm. Administrators would like to thank students, parents, staff and community for your support and donations!! This awesome event would not have been successful if it were not for you and your presence!! Thank You. Pictured are (Standing) Susie Barrera- Rio Grande City McDonald's Manager, Mary Vasquez-Community Relations Representative, Jessica T. Saenz-Ringgold Elementary Counselor and Jurella Costilla-Community Relations Coordinator. 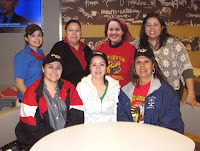 (Sitting) Graciela Gonzalez-Kinder teacher, Lisa Villarreal-Pre Kinder teacher and Araceli B. Garza-1st grade teacher.